The holidays are a time when people get a little more oomph in their step! We think about family, hum holiday tunes, aww at the sparkle of brightly colored lights, and for some of us, start to strategically plan for parking spaces at the shopping mall! Well, I am not sure about you, but I like to find alternatives to that last one. Although the hustle and bustle of the mall can be a festive experience, I am always on the hunt for unique gifts, for special family and friends, and one of the ways I find that is through local Holiday Boutiques. Come take part in a unique holiday tradition at the Red Horse Barn in Huntington Beach, where you can pose with Santa for the perfect Christmas card, shop among local artisans for a selection of unique gifts, find the perfect party dress, learn new make-up tips, sip on a cocktail or hot chocolate or a mixture of both… and yes, find a parking space with ease! Nestled in a secluded barn setting, surrounded by competitive Hunter/Jumper sport horses, The Red Horse Barn, part of Huntington Central Park Equestrian Center, is a little piece of tranquility in the bustling city of Huntington Beach. This beautiful event venue hosts private parties, elaborate weddings, executive workshops, company parties, Free Rein Foundation’s graduations, movie nights and the annual Neigh and Sleigh Boutique. 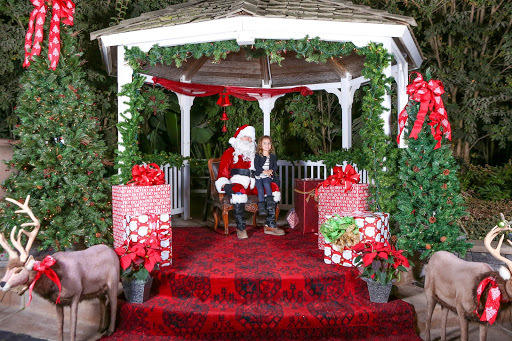 On Saturday December 1st, 10am to 5pm, the gazebo will be transformed into Santa’s wonderland, the perfect backdrop for your family Christmas cards. You will find the Pasquini Coffee bar serving delicious coffee and hot chocolate drinks, The Thirsty Horse Saloon will create the perfect cocktail to put you in a festive mood, and over twenty vendors offering a unique array of items from hand painted dream boxes to flavorful BBQ sauces. This is the perfect event for a girlfriend getaway or a family fun outing. Salem Cade, artist of fine art pet portraiture, Meleesa Ferris, representing Tulku’s Shakra collection and Gina Rowette, creating macrame art, are just a few of the vendors who were here last year. We are adding several new ones to the lineup. Dale, Dream Box artisan, Maddie, creator of Folk Dreams jewelry, Monica with Gold Canyon Candles, Julie enlightening us with Uforia Science and Kelly, of Kelly Cason Couture with her casual to black tie selection of affordable clothing. You do not want to miss this year’s Neigh and Sleigh and you definitely want to share it with all of your friends. Avoid the frantic hustle of the malls, take a break from your computer and leave Amazon at home. Come meet new people, support Free Rein Foundation (a portion of every sale goes to FRF), an amazing non-profit doing great things here in Huntington Beach, and find one of a kind unique treasures you can’t find anywhere else. This year’s Neigh and Sleigh is sponsored by and done in partnership with SoCal Saddlery, with special marketing assistance by Josh Mohr Real Estate. Justine Makoff is a passionate supporter and member of both the Free Rein Foundation and the Huntington Central Park Equestrian Center. She has been riding for over 15 years and works tirelessly to care for, ride, and share her love of horses with people in her community. Learn More.